I doubled everything except the cabbage – even the half head that I put in looked like WAY too much – as is, it barely all fit in my large wok to sauté. In the end, I thought that it turned out fine but would have been ridiculous with the extra. If anything, I would have added more spinach (a “bunch” is such a random measurement). MrT thought there were far too many mushrooms and says that it’s all he can taste but I don’t even notice them – I taste cottage cheese mostly….although I still think this is more of a “casserole” recipe than a “mac & cheese” – there’s not nearly enough cheese to warrant the title. Preheat oven to 350F. Lightly grease a 9 x 13-inch baking pan. Cook the pasta until just barely tender. Drain thoroughly, and transfer to a large bowl. Melt the butter in a large, deep skillet, and add the onions. 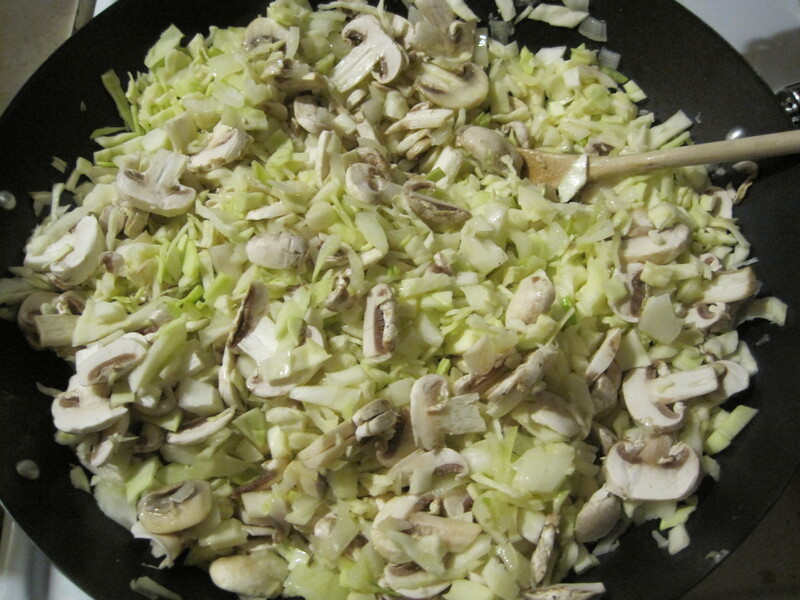 After sauteing for about 5 minutes, add garlic, mushrooms, cabbage, salt, and caraway. Stir, cover, and cook until the cabbage is just tender (10 minutes). Stir in spinach, and remove from heat. Add to the pasta. Stir in cottage cheese, buttermilk, dill, black pepper, and half the cheddar. Taste to adjust seasonings, and spread into the prepared pan. 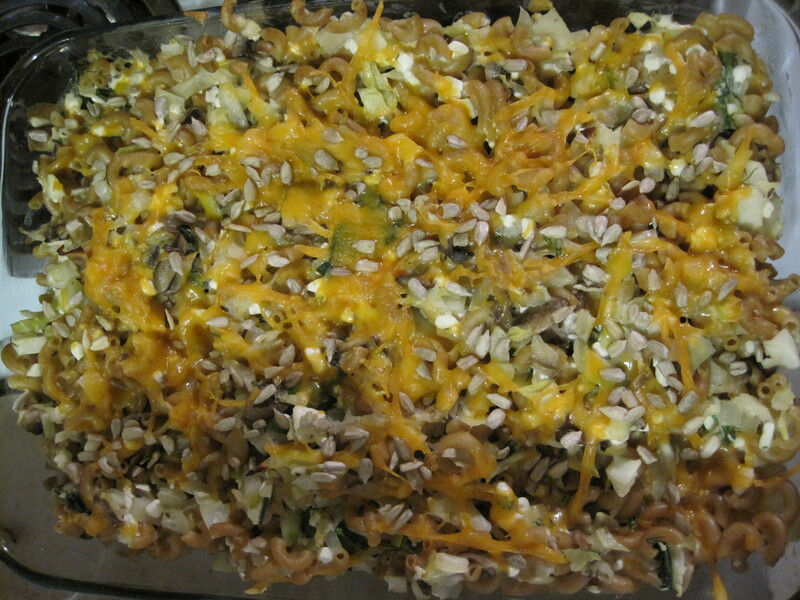 Sprinkle with the remaining cheddar and a few sunflower seeds, and bake uncovered for 20 to 30 minutes, or until heated through. This entry was posted on Wednesday, February 2nd, 2011 at 6:34 pm	and tagged with Casserole, Cheese, Dinner and posted in Dinner, Make ahead. You can follow any responses to this entry through the RSS 2.0 feed.